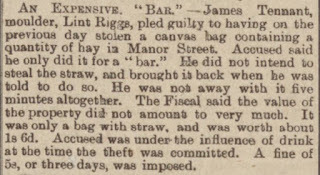 As I have previously noted, James 'Midgy' Tennant liked a drink, so much so it often got in the way of his football career. I just found this article about his 'exploits' being reported as far away as Angus. The victorians were weird people, well some of them were anyway. If you read enough into it their morals were generally projected upon the working classes in a "do as I say; not as I do" sort of way. 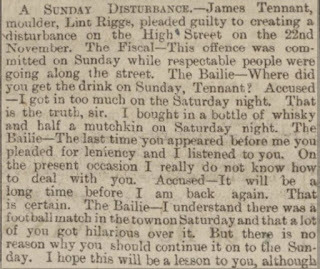 Temperance movements abounded, whilst at the same time "Gentlemen's Clubs" existed within which all manner of lasciviousness occurred beyond the prying eyes of the common or garden pleb, and handily beyond the reach of the licensing laws placed upon the Public House. 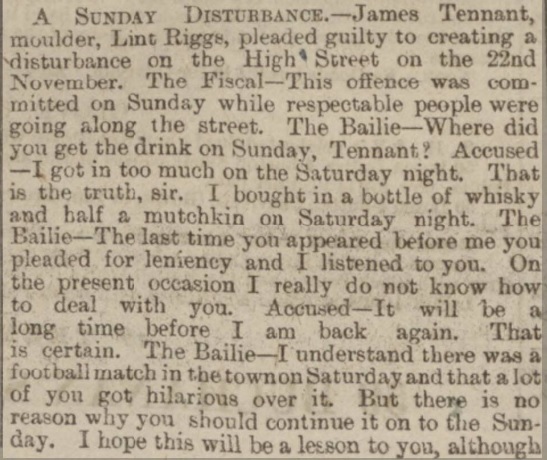 These victorian values even stretched their long arms into the realms of football [Dunipace FC, were literally formed as Dunipace Temperance Association Football Club], this was brought to mind when I came across this interesting case brought before the Falkirk Burgh Police Court on Tuesday 25th of September 1897 involving Falkirk FC's Centre-Forward of the time: James 'Midgy' Tennant. 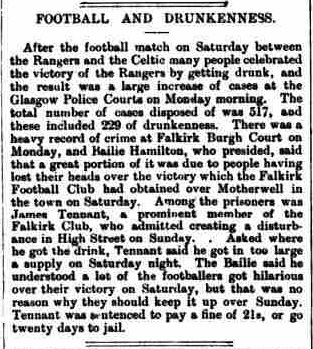 My antipathy towards the police, plus the fact that Tennant scored more than a hundred goals for my beloved football club makes me want to side with 'midgy' ... however ... in an extract from the same paper, another Falkirk FC player Bobby Fearns pleaded guilty to the charges, also James Tennant once signed professional forms for East Stirlingshire, claiming it was a mistake as he was drunk out of his head when he did it. Hmmmm. Still, when he was playing for Falkirk, he was good. 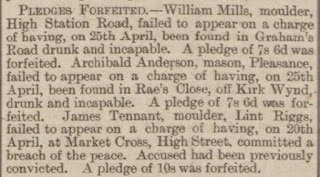 Note - It was very difficult to trace this chap, whether or not he was born out of wedlock I am unsure, but by tracking his parents and knowing his rough age, I finally found James Sinclair Tennant McCready in the record. In the 1881 census he is living with his grandmother in Lint Riggs, while his parents were living in Vicars Street. 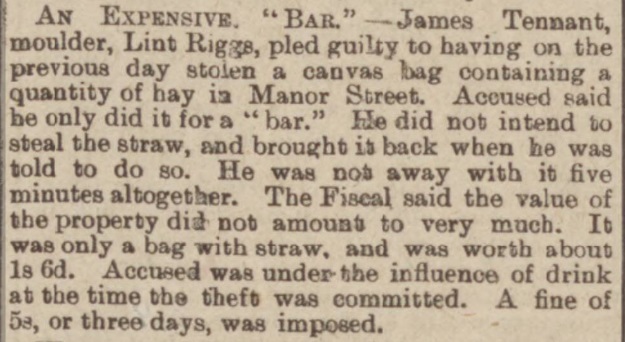 Note - Since this post was first published I have come across several more accounts of his drinking being reported in the FH. This is a report from the Falkirk Herald spelling out the findings of a dispute over whether Falkirk or East Stirlingshire owned two players. The thing to keep in mind when it comes to this, is that even though Falkirk effectively lost the case and had to publicly withdraw all allegations as to the ESFC getting them to sign 'under duress', neither Tennant nor McFarlane EVER played for 'shire [whereas John Pray, Alex Gillespie, Alex Stark, the brothers Gibson, and many other Falkirk regulars often turned out for ES, and vice versa Laurence McLachlan, Peter Steele, Alex Kennedy, etc for Falkirk], and both players trained with Falkirk throughout the three months in which they were only eligible to play for 'shire. The ES board maintained that it was all above board and they were Compos Mentis when they signed, but all the circumstantial and peripheral clues point to the fact that you should never spend a drunken Friday night in the Blue Bell Inn, Bainsford, else you might wake up Saturday morning a 'shire player. There were many fall-outs between the two clubs at the time, but by and large the relationship was amicable. 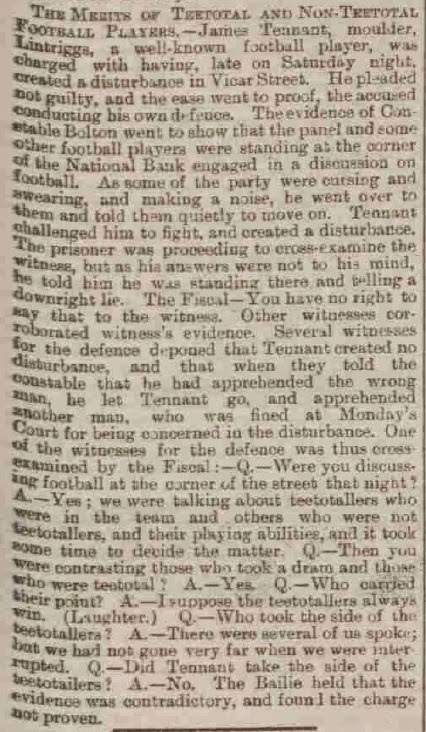 First- The Falkirk Football Club shall unreservedly withdraw and apologise for, in writing, all insinuations and imputations contained in the various letters sent by their Secretary to the East Stirlingshire Football Club anent the circumstances and others, under whichthe said Thomas McFarlane and James Tennant signed foresaid professional forms; and the said Thomas McFarlane and James Tennant and the said Falkirk Football Club, for their Interest, shall unreservedly withdraw and apologise for, in writing, all insinuations and imputations contained in foresaid summons and reduction against the East Stirlingshire Football Club and their members. Second- In consideration thereof the East Stirlingshire Football Club shall, so far as they can competently do so, grant release to the said Thomas McFarlane and James Tennant of their professional engagements with them. Third- The Falkirk Football Club and the East Stirlingshire Football Club shall play a friendly game at football at Brockville Park, Falkirk, on the afternoon of Saturday, ninth December, eighteen hundred and ninety three, at half-past two o'clock; the game to be suitably advertised. The price of admission shall be sixpence per head. The members of both clubs shall be admitted free on showing their membership cards. The free proceeds of the gate money shall be divided equally between the two clubs. 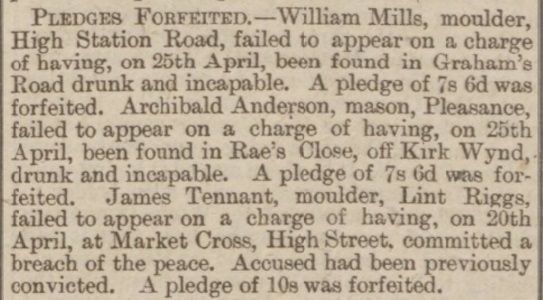 Out of the share falling to the Falkirk Football Club there shall be paid to East Stirlingshire Football Club the sum of seven pounds ten shillings sterling. Fourth- Both parties shall concur in having the action of reduction before referred to taken out of court with all convenient speed. The pursuers and defenders in said action shall each pay their own expenses. Fifth- The Falkirk Football Club and the East Stirlingshire Football Club shall pay the expenses of this agreement equally. The agreement is signed by Messrs Murdoch McIntyre and James Halley. It may be mentioned that in addition to the above, Falkirk receives the money drawn for the stand.